Having top quality grass can seem like an unachievable task. In suburban life it always seems like your yard just doesn't make the cut. All of that however, is about to change if you follow this simple lawn care guide. Following this lawn care guide will get you results that will have your neighbors wondering just how you did it. After using this guide you may need to consider getting a fence installed to keep the would be golfers from practicing their putts in your yard. The first key to that lawn of your dreams is to recognize the optimal times of the year for each lawn care task. Use this lawn care calendar to make one of your own, and keep to it. Never cut more than the 1/3rd of the grass blade at once! In your quest for that lawn of legends you may be tempted to cut your grass very low. This however would be your first mistake to avoid. Yes, those golf courses do have lovely short grass, but it didn't get that way over night. Longer grass allows the soil to remain cooler, and acts as a living mulch by trapping in moisture, this leads to greener grass and stronger roots. Cutting too much grass at once can cause it to burn and turn brown, and no one wants that. Before cutting anything be sure you are using a sharp blade! Dull blades will not only tear the grass but could also allow pathogens to enter the grass and could lead to disease. Be sure to check your blades at least once a year, and sharpen or replace as needed. With time and use the soil in your yard will become compacted, this process is speed up be heavy use. Compacted soil leads to poor water retention, and shallow roots. The required nutrients, air, and water can not penetrate the soil deep enough to allow for fully developed roots. Aeration should be done at least once a year. Aerate the ground using either a hollow or solid tined aerator. Hollow tined aerators leave shallower holes, but also remove a core of soil, this type of aeration works best in heavily compacted soils. If your yard only has low levels of compaction you may find a solid tined aerator to be sufficient. If you don't want a scary lawn, then you need to SCARIFY. Scarifying, also known as dethatching, isn't all that scary. It is the process of removing thatch or the dead debris such as leaves, old grass etc., which can build up in your yard. Scarifying should be done in spring and fall. In spring you will only need to do some light dethatching, in most cases a light rake works just fine. In the fall you will want to do a heavier dethatching using either a thatching rake or motorized dethatcher. Don't get too crazy about it however, a little thatch is ok and can even be good for your yard. Perhaps one of the most well known tips for a healthy yard, making sure your lawn has sufficient water is crucial to getting the ultimate yard. Thirsty lawns can look dull, lacking in color and often grow poorly. In sandy, or well drained soil water your lawn with about one inch of water, in clay or compacted soils you should only water about ½ an inch. The best time to water is early morning. Watering at night can cause mold and other diseases, and watering in the middle of the day may lead to burning the grass. Avoid frequent shallow watering which can lead to shallow roots, instead do a thorough watering 2-3 times a week. 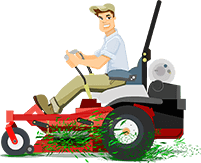 And never cut your grass when its wet, this is another common mistake that can not only lead to unevenly cut grass, but can lead to diseases as well. Tired of waiting? Get instant results with turf! Depending on your yard you will want to spread a compost and top soil mixture. Evenly spread the mixture across your yard, making sure the ground is level. Roll out that turf, and be sure to maintain it properly. Avoid walking on your new turf for at least a month, til' it can establish a healthy root network. One of the more overlooked steps in lawn care fertilizing can really add some luster to your lawn. In the fall and winter spread potassium (or Potash) rich fertilizers for a more cold resistant grass. In the spring, use fertilizers rich in nitrogen to promote vegetative growth making larger, greener blades that stand up to wear and tear a bit better. Be sure to spread the fertilizer evenly, using a seed spreader can help. Weeds have spent millions of years evolving, seemingly for the sole purpose of destroying your lawn and garden. Once they have crept in they are difficult to get rid of. Luckily you have come prepared, with your future technologies these weeds don't stand a chance. Keeping your lawn cut on a regular basis will keep many weeds at bay, but for those more stubborn ones you will need to either use weedkiller or your favorite weeding tool. When using weeding tools be sure to get the roots, or the weeds will be the ones saying “I'll be back”. So you have followed all of the tips in the ultimate lawn care guide, and there is still a patch in the corner of your yard? Sounds like you need to get some grass seed. Follow the directions on the packaging, and spread them evenly. Once you have spread the seeds in your problem spots, cover them with either some netting, or shredded straw to prevent the birds from stealing your glory. Be sure to get a perennial seed mixture, or you will be seeding again next year. Getting the ultimate lawn isn't all that difficult now that you are armed with the ultimate lawn care guide! Your destiny is before you, your green lawn awaits, so what are you waiting for?! Graphics Compliments of Creative Commons.